Geek blogs have been murmuring about this device for months, with explanations for the delay ranging from color-matching problems to an issue with the device’s backlight. And while no final date has been given yet, the company tentatively plans on releasing it in spring next year. Interestingly, ‘next year’ might also be the time the Verizon iPhone may be introduced. If so, the company might relinquish exclusivity with AT&T. That predicament leaves the company open to attack. 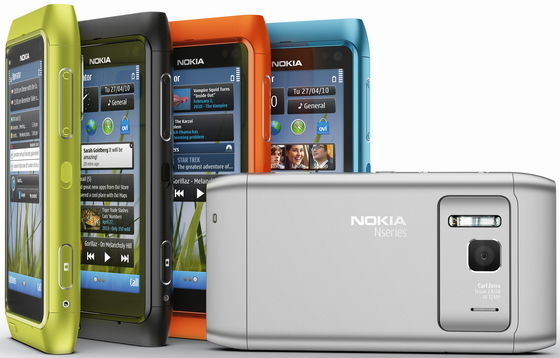 Enter Finnish mobile phone giant Nokia. The Finns and the Cupertino giant aren’t exactly best of friends(Nokia has sued Apple three times already), so Nokia is taking advantage of the situation and plugging its newly launched N8 device, while making jibes at the Apple’s inability to get the white iPhone off the ground. 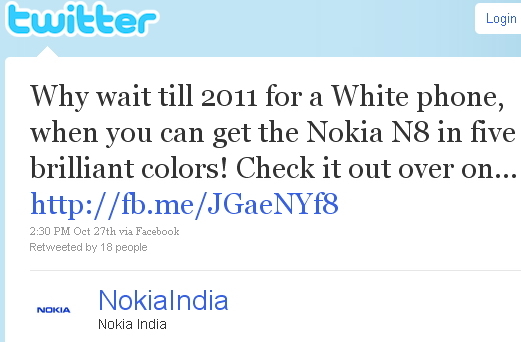 As you can see above, Nokia India says via its official Twitter account, that you don’t have to “wait till 2011 for a white phone”, because “you can get the Nokia N8 in five brilliant colors.” Exactly why anyone would want a fluorescent skinned brick for a phone is an epiphany that still eludes me, but I’m guessing that Gen-Y-ers might find some kinship with the phone that Nokia’s Head of Solutions, Anssi Vanjoki, has declared to be “the best entertainment phone”, who goes on to say that it combines a “lightning fast processor and graphics accelerator” with lots of capabilities (HDMI-out included) and “the best camera ever built in a mobile phone” – the 12MP Carl Zeiss autofocus camera with the “largest sensor ever used in any phone-like device”. The 12MP camera is a unique selling point here, but calling the N8’s 680 MHz processor “lightning fast” at a time of 1 GHz Snapdragons & Humminbirds virtually cropping up left right and center might be stretching it a bit though. The N8 is already up for preorder in the USA, UK and other places; expect it to hit retailers by the end of November, priced at around $400.